Camelot is in crisis. 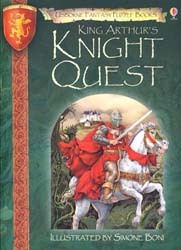 The Knights of the Round Table have been kidnapped by the evil sourceress Morgan le Fay and King Arthur's kingdom is in great danger. With only Merlin's crystal ball and a set of ancient maps to guide them, three apprentice knights set off on a quest to track down and rescue the missing knights.